Blacktown has a lot to be proud of, having the largest population of any suburb in New South Wales. It is also one of the most culturally diverse suburbs in Sydney with a wide range of nationalities and languages living in the area. The City of Blacktown includes almost 100 different suburbs and is home to almost half a million people! There are also a heap of local attractions for residents to enjoy, which is one of the reasons it is such a popular place. If you live in Blacktown, like most Sydney residents, you probably live a very busy life, trying to balance work and social commitments with family time. 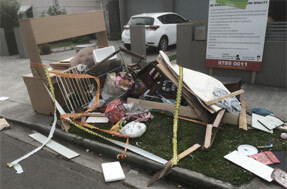 If there’s one job that can be a huge waste of time, it is rubbish removal. It doesn’t make sense to be spending time on items that you don’t even want! Waste removal can be a huge waste of time, energy and money – this is why you need to get a professional junk removal team like Same-Day Rubbish Removal to help you out. Call us today! Our team have been picking up all sorts of garbage from Sydney homes for the last 10 years, there’s not much we haven’t come across. The most common jobs we do include removing old mattresses, broken white goods, bulk business e-waste, and scraps from home renovations/clean-ups. There hasn’t been a job too hard for us yet, so whatever it is that you’re trying to get rid of from your Blacktown home, our friendly and experienced team would love to help you out. As the amount of waste being produced in Sydney has been increasing over the years, our team has realised the importance of responsible rubbish disposal. We’ve always tried to recycle, but we now take every effort to try and save more waste from going to landfill. If your junk can be recycled, we’ll make sure it happens! Even before you give us a call, we’d love it if you tried to find your unwanted items a new home. If they’re completely broken, sure, no one wants that – we’ll be happy to try and have it recycled for you. Our fast, friendly, easy and affordable service isn’t only available to Blacktown residents, we service all Sydney regions and suburbs. From out in Penrith, over to Balmain, and right across to Waverley in the Eastern suburbs, our team are ready to help you get cleaned up. We never leave a site until it is looking spotless, which is one of the reasons our customers keep coming back to us. Our experience means we know all the shortcuts across Sydney and the most efficient ways of running our business, which is why we can offer such fast service at the best price. If you’re ready to have your place cleaned up and your junk gone, give our friendly and experienced team a call now on 0402 737 046. We’ll provide you with a free, no obligation quote, but we promise you’ll find it hard to refuse! We can’t wait to hear from you. 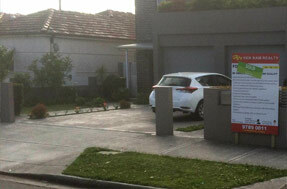 Looking for the Cheapest Service in Doonside? In the heart of the City of Blacktown, and located just east of the suburb of Blacktown, Doonside is home to over 13,000 residents. Being 40km out of the Sydeny CBD is why many residents consider the city they live in Blacktown and don’t refer to Sydney. It does get confusing! With smaller cities within Sydney, it means that Doonside residents can have access to almost all the shops and services that someone living in the CBD has. With large shopping centres like Westpoint nearby, residents have access to everything they need. It’s also a handy location right near the M7, being able to skip the crazy traffic of inner Sydney and escape either to the north or south. 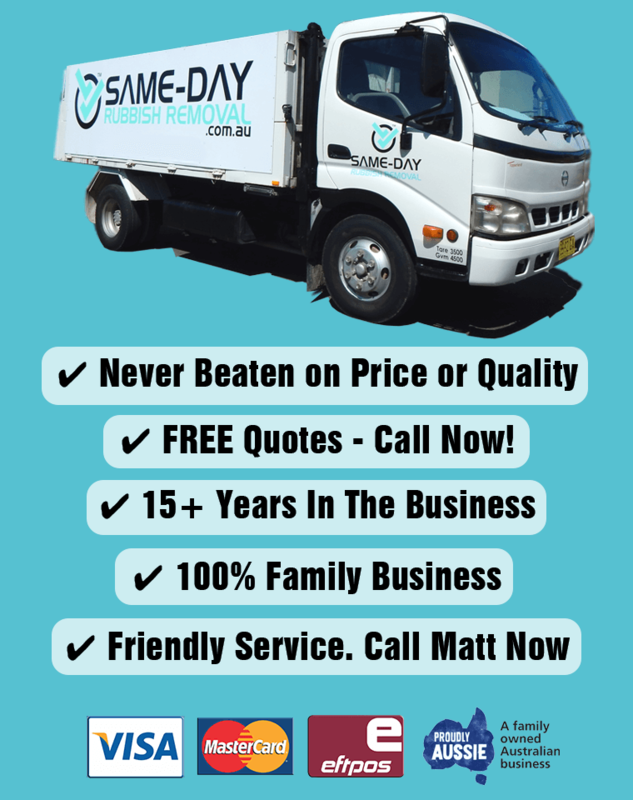 Same-Day Rubbish Removal offer the fastest and cheapest rubbish removal in Doonside, so there’s no need for you to use the road – we’ll take your junk away for you. Call us! To the east of the suburb of Blacktown, Seven Hills borders the City of Blacktown and the City of Parramatta. Like Doonside, there’s not much that Seven Hills residents go without having access to all the great shops and services that are on offer in the area. With a name like ‘Seven Hills’, one could think it is located in the Hills District or really just really hilly. The latter is somewhat correct, as it’s landscape could be compared with many of the hilly suburbs throughout Sydney. There’s no hill or mountain that will stop our team serving you, so if you’ve got junk that needs to go from your Seven Hills home or business, give us a call now and we could even have it gone today! Split between the City of Blacktown, the City of Parramatta, and the Cumberland Council, Toongabbie is just next door to Seven Hills. The suburb was named by Governor Arthur Phillip who asked the local Aborigines what they called the place – Toongabbie means place by the water. There may not appear to be much water in the area, but Toongabbie Creek is connected to the Parramatta River which runs into the Sydney Harbour. It’s possible that there was a lot more water in the area when the Aboriginies named the spot, but like a lot of things, so much has changed in the area. Unfortunately, the amount of waste that is produced in the area now is not even comparable to even just a few decades ago. There’s a rubbish problem, not just in Toongabbie, but right across Australia. If you’ve got junk that needs to be taken away, give our team a call – we’ll dispose of it responsibly.